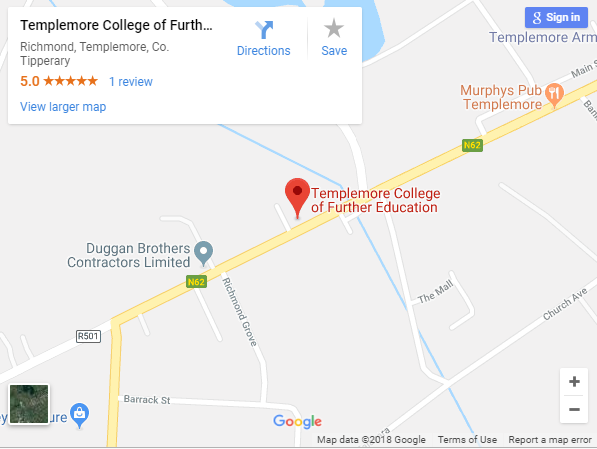 Templemore College of Further Education is the only exclusive Post Leaving Cert. (PLC) College in Tipperary. We provide a unique further education environment for all our students – both younger students just completing Leaving Cert. and more mature students returning to education. Collaboration of young and mature, experienced and fresh, provides a learning culture in the College that is challenging yet supportive. Our objective is to enable all students get the best out of themselves and this is achieved by developing relationships which are respectful and inclusive. We provide thirty programmes at levels 5 and 6 with certification from awarding bodies including QQI, Dept. of Education, City & Guilds, CIBTAC, CIDESCO, and CISCO. Many students are prepared to progress directly into employment while others progress to Higher Education. The preparation, consisting of one or two years courses, enables the development of independent and collaborative learning skills, which provides foundational skills whether employment or higher education is the progression route of choice. Many of our students take the time on a PLC course to find out a little more about their likes and dislikes, their strengths as well as areas that they need to develop further. Ultimately, students who complete a PLC course are in a better position to decide future directions. It is an interesting fact that many Higher Education providers universally agree that students who complete a PLC course, younger as well as more mature students, are more resilient with completion rates far higher than students who go directly to Higher Education after doing the Leaving Cert. Students who are unsure about progressing to Higher Education can defer for a year to do a PLC course, after which they are better positioned to be assured of the choices they are making. Furthermore, students who are approved for the SUSI grant, will continue to receive the grant if they progress to Higher education. All in all, the benefits to doing a PLC course are compelling. It’s a winner for younger students and their parents who can be more assured about Higher Education choices and be confident that the major financial investment will result in the completion of the degree chosen. It’s a winner for more mature students who are nurtured into a supportive learning environment which ultimately leads to more confident, self-directed learners. We welcome students throughout the summer and we will be holding an Open Afternoon on Tuesday August 28th from 2:00pm to 5:00pm. This is an occasion for potential students to visit and talk to teachers and management, see the facilities, and get a feel for a College that has been providing a ‘college experience’ for thousands of students over the past decade. We look forward to seeing you.